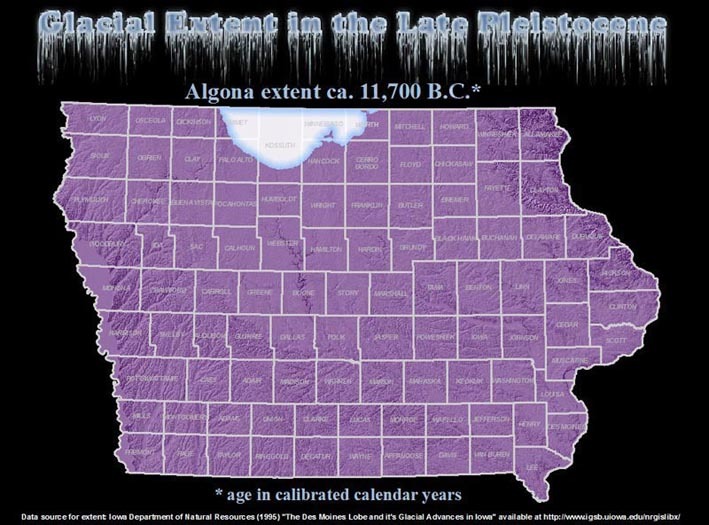 The first people living in Iowa arrived about the same time as the last of the Ice Age glacier was retreating northward. Millennia would pass before their descendants began growing their own food. 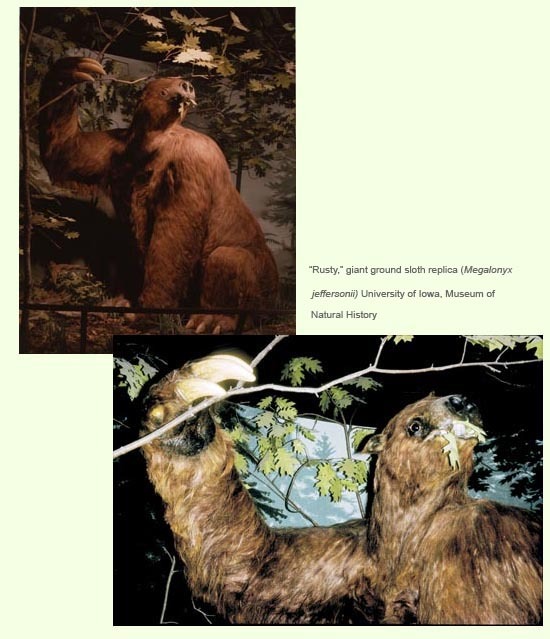 The warming climate, which halted the ice, allowed the earliest human settlers to occupy a landscape of cool, moist coniferous forests interspersed with open meadows and wetlands populated by many animals and plants never again seen by later peoples. 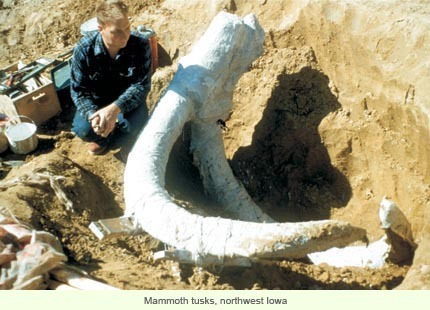 Iowa has produced impressive remains of large Ice Age mammals such as mammoth and giant ground sloth at sites like the Allied Mammoth Site in Des Moines and West Tarkio Creek in Page County. 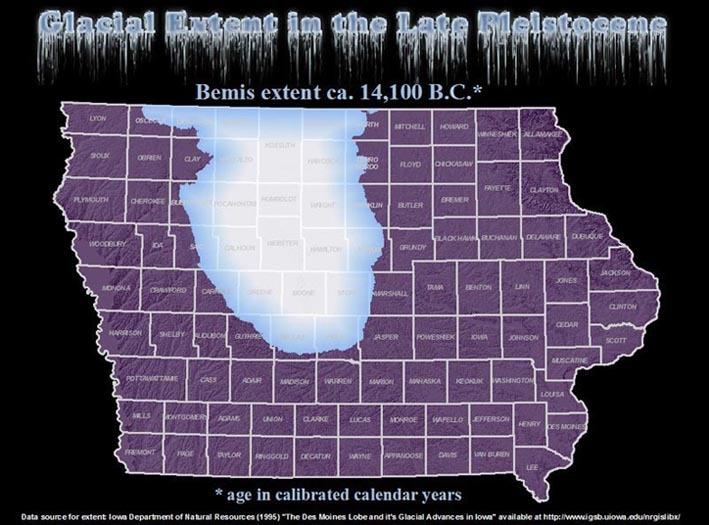 Clues to these earliest inhabitants come from the stone projectile points—named Clovis and Folsom—used as weapons and cutting tools—lost, forgotten, or cached at early Paleoindian period sites across Iowa. 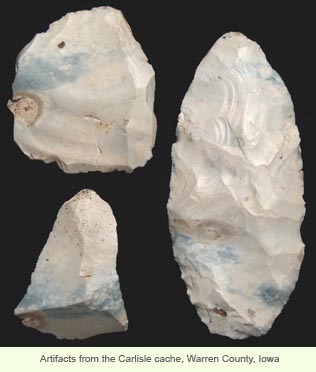 These early artifact discoveries tend to occur near streams or rivers, often in confluence areas, and near sources of high quality chert or flint. 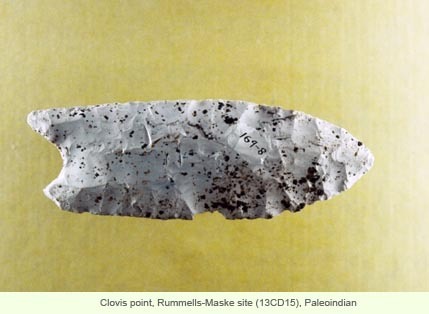 To date, over 200 Clovis and Folsom points have been recorded across the state, many found by collectors walking cultivated fields and stream beds. Only the Rummells-Maske site in Cedar County and the Carlisle cache in Warren County received professional excavation. A Clovis point discovered in Woodbury County retained blood residue sealed beneath a layer of calcium carbonate. Chemical analysis of the blood indicates the point had been used to hunt deer or elk. 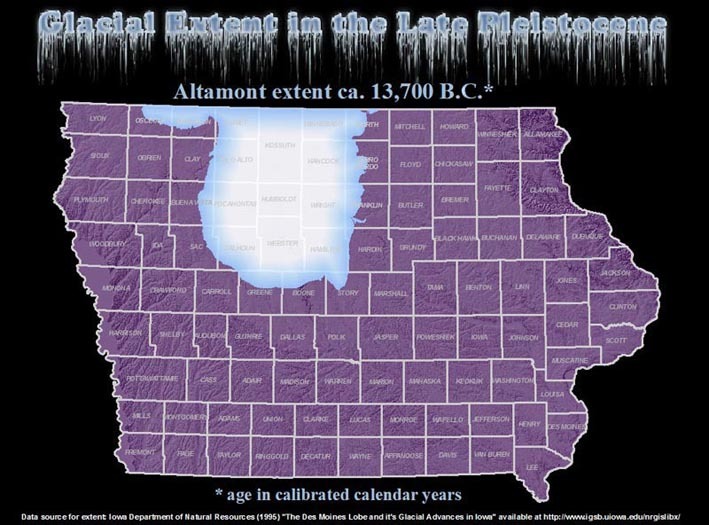 The way of life for these earliest Iowans was likely nomadic with small communities moving to take advantage of resources. 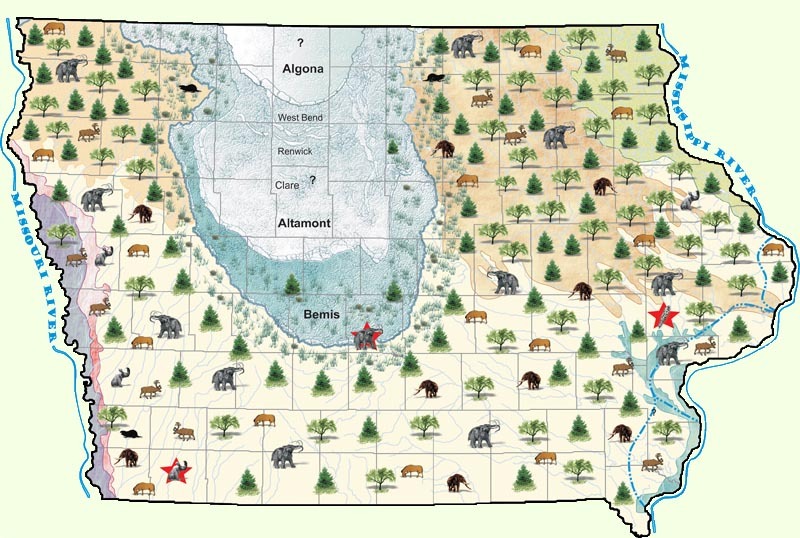 From various sites outside the state, we know that Paleoindian hunters often worked together to drive animals into areas where they might more easily be killed and then butchered. 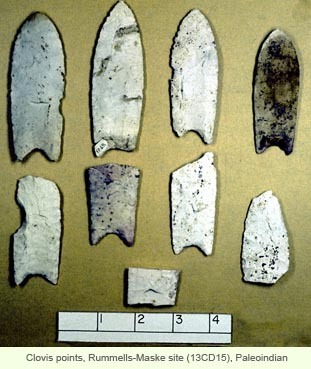 In addition to spearpoints, contemporary artifacts include knives, scrapers, abraders, choppers, rubbing stones, and some bone and antler artifacts. Most of these seem to reflect game processing and hide work. 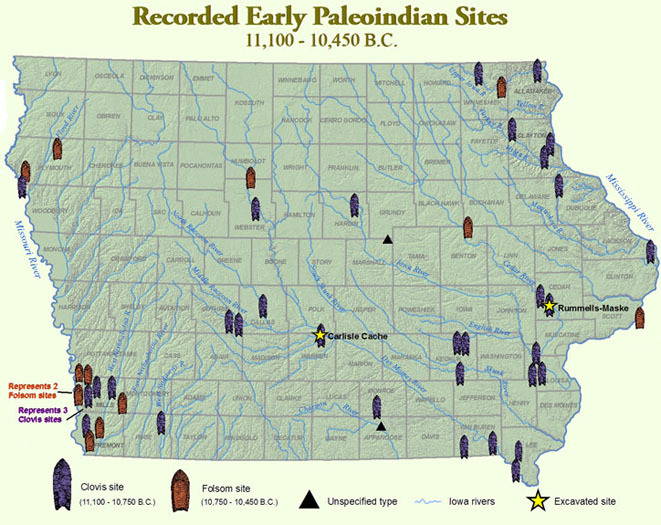 Almost nothing is known of early Paleoindian society, housing, more perishable artifacts like clothing, or plant use. It is assumed that communities were small, probably extended families. Housing would likely have been temporary, involving some sort of branch or bone framework with a covering of skins or mats. Clothes likewise would have been made of skins. A few wild seeds like those of hackberry are occasionally reported at Paleoindian sites. These kinds of items do not usually survive except under rare circumstances of preservation. 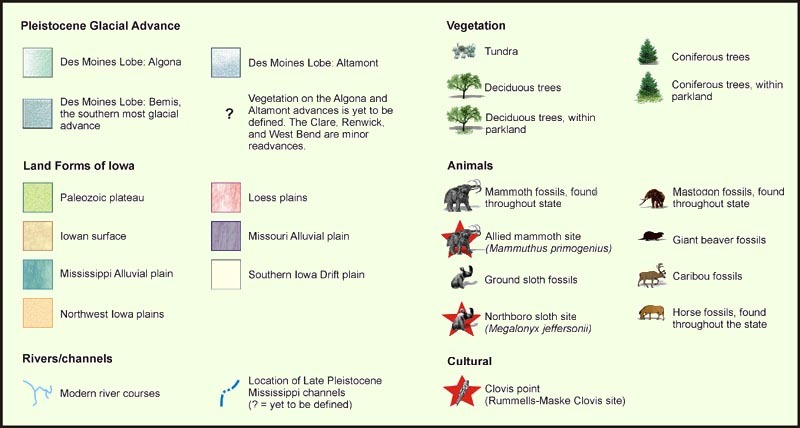 To piece together a picture of this earliest period of Iowa’s history takes the combined contributions of scientists from a number of fields— geology, paleontology, and archaeology. Recent discoveries, like those at the Rummells-Maske and Carlisle sites are adding to our understanding of this remote period.